Bunker living was awful in the best places and could be much worse. 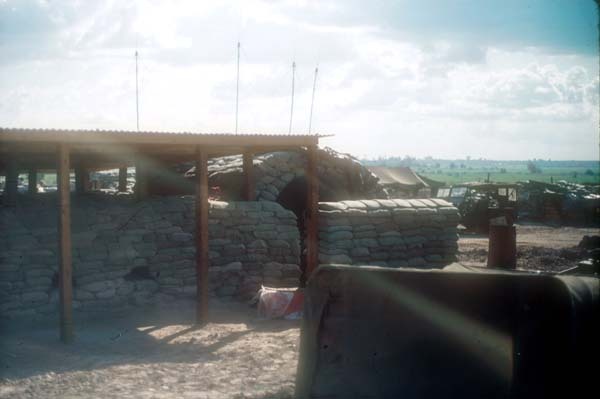 This bunker has a tin roof, neat orderly sandbags and wood walls inside, but those luxuries could not get rid of the stale humid air. Fresh air was a stranger in this bunker and the accumulating stench of sweaty, unclean human beings did not escape. Many insects shared our earth walls and mosquito clouds drifted in throughout the night and early morning. Rats moved around unchallenged unless by one of the local venomous snakes. Six humans living and working in a 250 square foot hole in the ground made for some spirited arguments and power struggles.